California’s weather has gone bipolar! It was rainy and high 50s (°F) by the end of last week; today is sunny and ~90°F… I had to grab a cold drink on my way home from work. 85°C Bakery Cafe is a self-serve bakery chain from Taiwan. They’ve had stores in Southern California since 2009. In November, they opened their first store in Northern California, in Newark. They just opened their San Jose store last week. They also have drinks and cakes in addition to their breads. 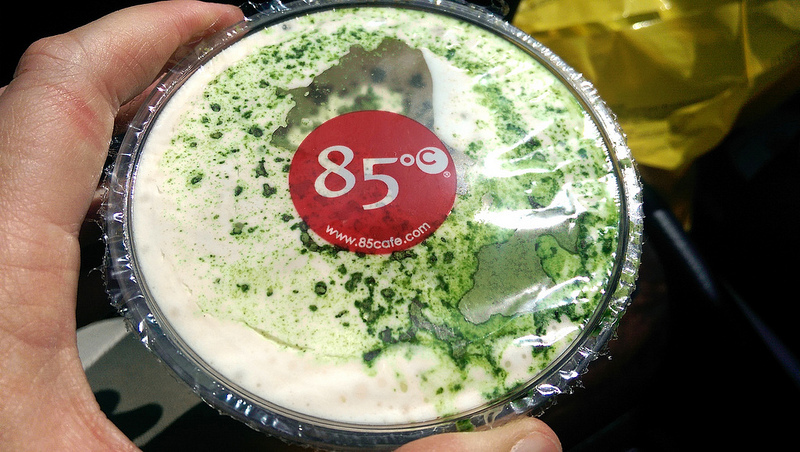 My favorite drink at 85°C is the Sea Salt Jasmine Green Tea, which is a type of foam milk tea. The top layer has ice and foam milk, topped with matcha powder. The bottom layer has the jasmine green tea with the sea salt on the very bottom of the cup. Like most pearl milk teas, you shake the drink before inserting the straw through the lid. 泡沫奶茶 (Pinyin: pàomò nǎichá), “foam milk tea” – one of the many variants that is prepared the same way as the “foam red tea”, well-shaken before serving. 泡沫紅茶 (Pinyin: pàomò hóngchá), “foam red tea” – by direct translation, is the drink that is more appropriate for the more literal name of “bubble tea”; however, the English name, foam tea, is not used much throughout Asia. Consequently, in non-Chinese-speaking Asian countries, “bubble tea” is commonly used to refer to this drink. There is no tapioca in this particular drink. To create this, vendors mix hot or warm tea (in this case, black tea) with syrup or sugar and ice cubes into a cocktail shaker. Then they would shake the shaker either by hand or by machine before it is served. The resulting tea would be covered by a layer of foam or froth and the tea would have a light foamy feel to the taste. [Edit on 05.08.2015] My sister and I went to a LATTEA (綠蓋茶) in Taipei, where we ordered a sea salt foam milk tea. It was served in a tall glass mug without a straw, as shown in the photo below. We were confused because we were accustomed to having the drink with a straw, so the waiter said this drink was meant to be consumed as a regular beverage, by sipping from the top of the glass. The foam-to-tea ratio actually stayed pretty consistent throughout, much to my dismay, and the taste was pretty consistent until I finished the drink!